Big Island Quarries operates out of its family owned quarry in the historic town of Wiarton, near Georgian Bay, on the Bruce Peninsula. The business operations are divided into two different areas, quarrying and production. The quarrying operations focus on rock extraction from our quarry using various methods. 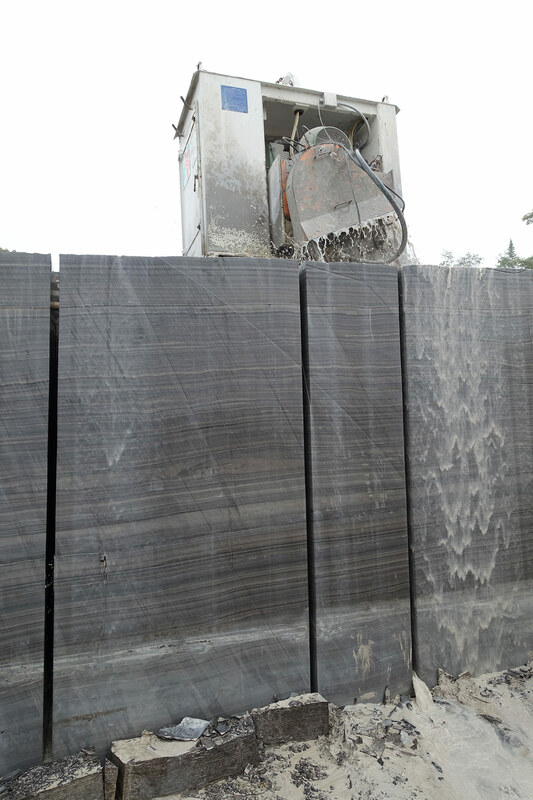 Normally the Eramosa stone lies many feet below the ground surface, so several layers of overburden must be cleared off before proper stone can be pulled out. This involves removing dirt and gravel, then peeling away the layers of soft Guelph limestone that covers the Eramosa. Once the Eramosa surface has been reached, we can then move on to preparing the site for cutting by cleaning off any remaining dirt or gravel in order to determine where the cuts should be made. This allows us to maximize the efficiency of the cuts, and attain greater block sizes. Having a clean surface is also necessary for the saw's rails to be properly levelled, ensuring a good straight cut. Once the blocks are cut, they can be easily pulled out with a front end loader and placed into our heated storage facility. Once we have extracted stone, it is either sold as blocks worldwide or it is processed into various products for the construction and landscaping industries. Eramosa and Wiarton Buff building stones are popular products thanks to their distinctive colour and use in local heritage structures. Our production facilities allow is to fabricate a number of different standard sized products, as well as giving us the ability to do custom sizes for special order jobs. Having our production facilities located on site at our quarry gives us more efficiency by keeping waste low.